The city of Nanjing’s traffic police has announced a new service whereby, as of 01 January 2015, minor accidents (mostly those that do not involve deaths or injuries) can, in addition to being reported to police via telephone, also be reported using WeChat. The service is presently available for cars insured by PICC and Pacific Insurance Company inside Jiangsu. Car keepers will need to follow the official Nanjing traffic police Weibo account 南京交警, then click on Personalised Services (个人中心), followed by Express Accident Reporting (事故快处). A personal account then needs to be registered and be linked, and details must be provided, so that in the case of accidents, reporting happens faster. 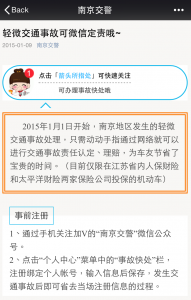 If accidents happen, reporting via WeChat requires sending the police your current location via geotag (WeChat can send a single tweet which has nothing but a geotag sent), number plates, pictures of the accident (a picture of the entire accident location, plus the front and back of cars and the places hit; no less than 3 pictures). This must be confirmed by sending another message consisting of just the letter Y. The same procedures apply to reporting the licences of the drivers involved, as well as insurance information. Information on the entire procedure is available in simplified Chinese at the official WeChat account of Nanjing Traffic Police.